We’d love your help. 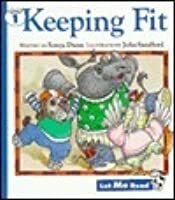 Let us know what’s wrong with this preview of Keeping Fit by Sonja Dunn. Dear Parents, Let Me Read books are sized just right for kids! These simple books use playful language, such as thyme and repetition for instant success. The collection offers a wide variety of books for young readers to read and enjoy--all by themselves.! To ask other readers questions about Keeping Fit, please sign up.